Society is at a crossroads. Here at home and around the world, we are living in a manner that is absolutely, unconditionally, irrevocably unsustainable. 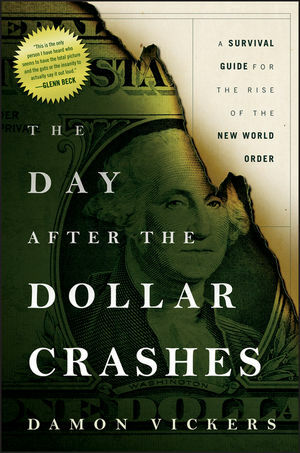 The Day After the Dollar Crashes: A Survival Guide for the Rise of the New World Order outlines the kinds of events that could trigger a global economic collapse, describing in detail the events that are likely to occur just prior to, during, and immediately following such a total collapse. It also explains how investors can profit and support a sustainable future by anticipating social trends. The Day After the Dollar Crashes tears away the illusions generated by politicians, media, and the financial industry to show how investors can position themselves to survive and thrive in a New World Order. Damon Vickers Chief Investment Officer of Damon Vickers & Co., an investment firm located in Seattle, Washington. In the 1990s, Vickers and his customers were early investors in such companies as Starbucks Coffee, Cisco Systems, and Amazon.com, to name a few. Mr. Vickers called the top of the equities markets in 2000, and in 2008, during the worst market year since 1987, a private fund initially capitalized by Mr. Vickers enjoyed returns of 63%. A frequent guest on financial television such as Glenn Beck, CNBC, Bloomberg, Fox Business, and BNN in Canada, Mr. Vickers has also been quoted in the Wall Street Journal, the Washington Post, and other widely read publications.